As they made their getaway, the gunmen shot dead two policemen, including one who they shot in the head at close range as he lay injured on the pavement. 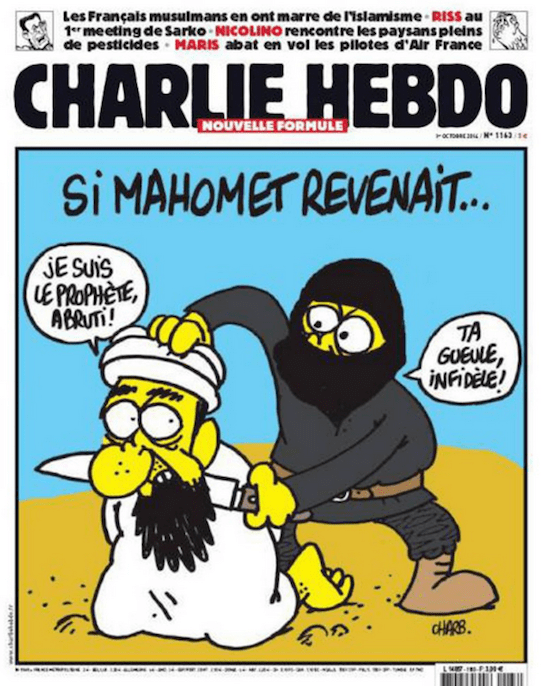 Charlie Hebdo has courted controversy regarding depictions of the Prophet Muhammad in the past, starting in 2006 when they responded to the Jyllands-Posten controversy with images of the Prophet Muhammad of their own. Their offices were firebombed in 2011 in response to a cover changing the name of the paper to “Charia” (for Sharia) Hebdo with a “guest editorial” by the Prophet. There is some question as to how Islam regards depictions of the Prophet Muhammad. The Qu’ran does not ban depictions of the Prophet. However, some variations of the hadeth – a collection of Muhammad’s teachings that I could best compare to Proverbs – outlaw the practice. It should also be noted that French Muslims have dealt with considerable discrimination despite their heavy presence in France’s population when compared to the rest of Europe; in 2010, a French government panel recommended banning the Hijab in public buildings. The response by some on the French right has been openly hostile to Islam, and many Muslims are bracing for retaliation. Even The Onion, which has responded to threats of violence in the past by responding with hilarious and often NWS retorts, was noticeably downcast in their response. It is my personal belief – one that I will concede risks politicizing this topic at a sensitive time – that one thing bears mentioning: I don’t know of too many children who have the ability to write who put down “I want to kill people when I grow up!” on paper. That’s because just about any form of extremism is born from desperation. The Islamic State isn’t an uprising of well-to-do people; it, along with Al-Qaeda and other extremist groups, is an uprising of people who feel that they have nothing else to live for, being taken advantage of by people who are teaching a perverted form of Islam to those that don’t have the means to know any better. When you live every day in abject poverty, in fear of drone strikes, a bunch of virgins start to sound enticing. Times like this bear a link to what Afghanistan used to look like. Miniskirts, uncovered heads, a useful economy… it’s hard to place those images with what has replaced them in my lifetime. But a populist revolt overthrew the King in 1973, and starting in 1979, the Soviet Union invaded as part of their larger proxy war against the United States, leading to a civil war that lasted ten years and only ended thanks to American intervention. The country never recovered. I bring up Afghanistan in this context because that’s basically been the entirety of the Arab middle east: a pawn for the two big superpowers to play with, damn the consequences. Those countries’ destruction opened the way for many extremist groups to come about; The Islamic State is little more than a Pokemon evolution of all of the movements before it. Those groups, for many in this area, are the only way to get out of their sorry way of life. Those groups teach the bastardized form of Islam that educated Muslims denounce on a daily basis. Every time a drone strikes a wedding party in one of these countries, we make those groups a little stronger. Free speech and free thought are the antithesis of what extremist Muslims – or really, extremists of any religion – want or believe in. If we want to create less extremists, we must allow the way of life in these countries to improve. Until that point, what happened to Charlie Hebdo, the girls kidnapped in Nigeria by Boko Haram, the beheading of the Western journalists and aid workers, and other cases of extreme terrorism will continue, the head-shaking will continue, the hatred will continue, and the cycle will get stronger and stronger, not unlike the circling of water around a toilet drain. UPDATE @11:46AM ON 1/8: Charlie Hebdo’s Patrick Pelloux has defiantly announced that, instead of printing the standard run of 60,000 magazines, their next issue will print 1m copies. Charlie Hebdo will publish next Wednesday to defiantly show that “stupidity will not win,” columnist Patrick Pelloux told Agence France-Presse, adding that the remaining staff will soon meet. “It’s very hard. We are all suffering, with grief, with fear, but we will do it anyway because stupidity will not win,” he said. 1 – I will not link to or mention any of these people or their hashtag. I refuse to give them oxygen.